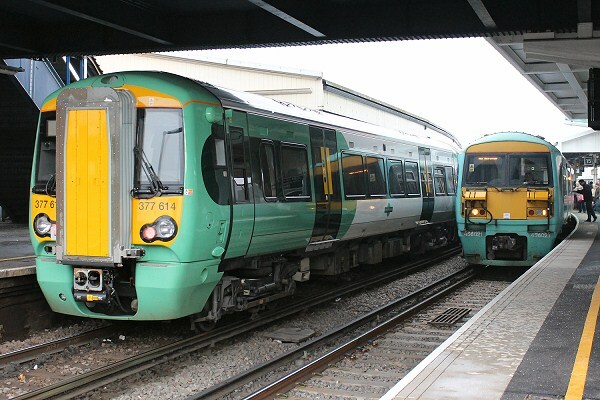 In addition to the potential for running trains as 377/3 + 377/3 + 4 car 377, Southern is achieving its 10 car inner suburban service by the introduction of 26 Class 377/6 units. These are high density seating new generation Bombardier Electrostar (i.e. 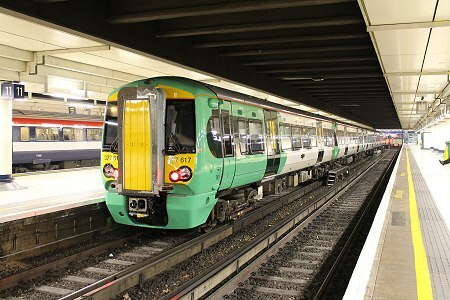 similar to Class 379) trains. They are formed DMSO - MSOL - TSOL(W) - MSO - DMSO and seating is 2+2 throughout with plenty of (green coloured) grab rails. 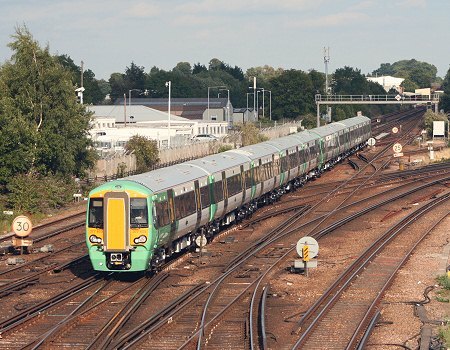 Units are delivered from Derby to Stewarts Lane for acceptance testing and mileage accumulation before transferring to Selhurst for introduction to service. Although the fleet was due to be in full squadron service from the December 8th timetable change the reality is they will be continue to be phased into service throughout December. The timetable change starting with 16 out of 24 diagrams being run by Class 377/6, the balance being run by a combination of Class 455 and remaining Class 456 units. There is some conflicting data about and the below is shown in good faith, but is subject to verification. Key spotting differences from other Southern Electrostars are (apart from obviously having 5 cars and being bright and shiny at the moment!) that ribbon glazing has been replaced by windows cut into the side and there is a track recording camera light on the fairing to the lower left of the coupler (see the picture below), both as per Class 379. 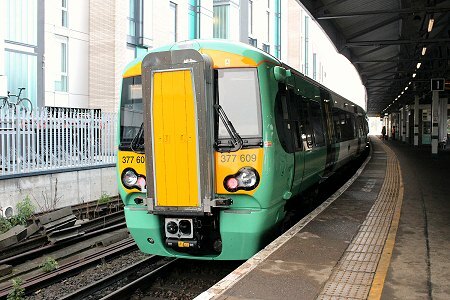 New Class 377/6 units are actually being tested on the South Eastern, running between Stewarts Lane and Dover Priory via Ashford. Here 377605 and 377604 are about to pass through Tonbridge, returning from Dover, on 14th August 2013. 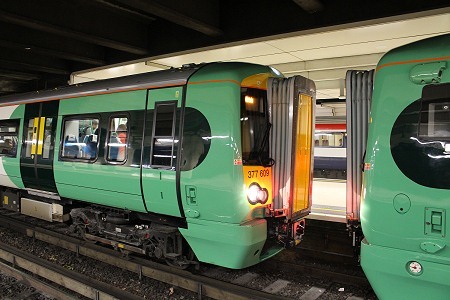 The 26 Class 377/6 5 car units are, in part, replacing the 24 Class 456 2 car units, which are transferring to South West Trains for refurbishment and then to work with their Class 455 units to enable10 car services for the south west suburbs. Here at Clapham Junction on December 12th 2013 are old and new. 377614 is working the 09:56 Caterham to Victoria service (diagram SU 614) whilst 456021, 456012 and 455808 are working the 10:31 to Horsham from Victoria. The older units are working a diagram (SU605 + SU606) that will become 10.377/6 when sufficient units are available. 377609 at Epsom whilst on the 11:01 Victoria to Dorking service (diagram SU622) on 12th December 2013. We will catch up with 377609 later. 10 car suburban working on 12th December 2013. 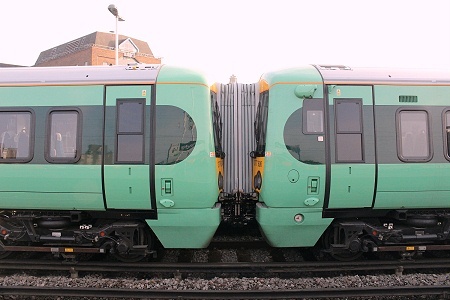 377604 (left) and 377606 (right) are seen coupled together at Clapham Junction whilst working the 11:23 Victoria to Epsom Downs service. Getting ready for the evening peak on 12th December 2013, at the buffer stop end of platform 11 377617 has arrived with the 15:56 from Caterham (diagram SU613). Now back with 377609 on diagram SU622. This unit arrives with the 15:56 to Dorking. Once its passengers are clear and platform staff allow no-one onto platform 11, it will couple to 377617 to return to Surrey with the 17:01 to Epsom Downs. Southern look on course for full introduction of the class by the end of 2013 or very early 2014. By the 18th December 2013 only 377601, 377602 and 377603 remained to be commissioned. 377602 was delivered from Derby on 14th December, 377601 on 18th December and 377603 on 20th December. Of the dual voltage/dual pickup Class 377/7s, 377701 was observed on the test track at Derby on 15th December 2013.